You can also use the advanced animation tools to position your layers. The Reposition Drawing tool allows you to reposition drawing elements in the Drawing view while simultaneously creating keyframes for each drawing. This allows you to easily reposition misaligned drawing elements that may require the same pivot point and positioning in the Drawing view. 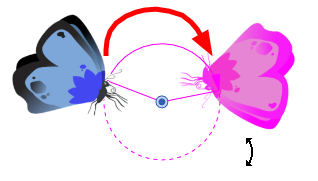 Some transformations, such as the rotation, scale, skew and flip, are made relative to the pivot point position. You can reposition this pivot point anywhere using the advanced animation tools. 1. 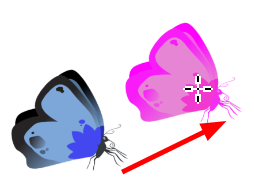 In the Advanced Animation toolbar, select the Rotate , Scale or Skew tool. 2. In the Camera view, [Ctrl] + click (Windows/Linux) or [⌘] + click (Mac OS X) to select your element. 3. Drag the pivot point to a new position. This is the new position of the pivot point for future transformations until you reposition it. Using the advanced animation tools to permanently reposition your pivot overrides the existing pivot point position until you change its position again. ‣ In the top menu, select Animation > Tools > Translate. ‣ Press [Alt] + . 2. In the Camera view, [Ctrl] + click (Windows/Linux) or [⌘] + click (Mac OS X) on the element to select it and drag the selection to a new area. You can select multiple layers to reposition them at the same time. Press [Ctrl] + [Shift] + click (Windows/Linux) or [⌘] + [Shift] + click (Mac OS X) on each element to select them. ‣ Select Animation > Tools > Rotate. ‣ In the Advanced Animation toolbar, click the Rotate tool. ‣ Press the [Alt] + . 2. 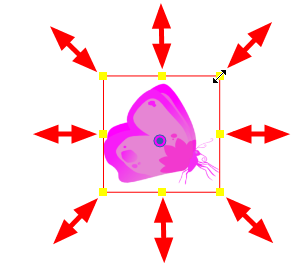 In the Camera view, [Ctrl] + click (Windows/Linux) or [⌘] + click (Mac OS X) on the element to select it and rotate the layer. You can select multiple layers to rotate them at the same time. Press [Ctrl] + [Shift] + click (Windows/Linux) or [⌘] + [Shift] + click (Mac OS X) on each element to select them. ‣ Select Animation > Tools > Scale. ‣ In the Advanced Animation toolbar, click the Scale tool. 2. In the Camera view, [Ctrl] + click (Windows/Linux) or [⌘] + click (Mac OS X) on the element to select it and pull or push either on the side, top or corner control point. Hold down [Shift] to lock the selection’s ratio when using the corner control points. You can select multiple layers to scale them at the same time. Press [Ctrl] + [Shift] + click (Windows/Linux) or [⌘] + [Shift] + click (Mac OS X) on each element to select them. ‣ Select Animation > Tools > Skew. 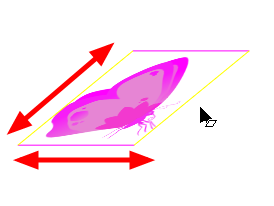 ‣ In the Advanced Animation toolbar, click the Skew tool. 2. 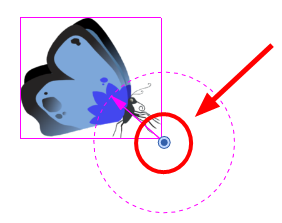 In the Camera view, [Ctrl] + click (Windows/Linux) or [⌘] + click (Mac OS X) on the element to select it and drag a side of the bounding box up, down or sideways. You can select multiple layers to skew them at the same time. Press [Ctrl] + [Shift] + click (Windows/Linux) or [⌘] + [Shift] + click (Mac OS X) on each element to select them. Refer to the Interface chapter to learn how to display the Advanced Animation toolbar.